For a generation, the Catholic Church in Brazil has enjoyed international renown as one of the most progressive social forces in Latin America. The Church's creation of Christian Base Communities (CEBs), groups of Catholics who learn to read the Bible as a call for social justice, has been widely hailed. Still, in recent years it has become increasingly clear that the CEBs are lagging far behind the explosive growth of Brazil's two other major national religious movements—Pentacostalism and Afro-Brazilian Umbanda. 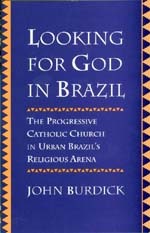 On the basis of his extensive fieldwork in Rio di Janeiro, including detailed life histories of women, blacks, youths, and the marginal poor, John Burdick offers the first in-depth explanation of why the radical Catholic Church is losing, and Pentecostalism and Umbanda winning, the battle for souls in urban Brazil. John Burdick is Assistant Professor of Anthropology at Syracuse University.